Rumors started Thursday morning that apparently the Cleveland Browns and their new owner Jimmy Haslam, are thinking about targeting Nick Saban as their new head coach. Now, keep in mind that the Browns new owner is apparently a Tennessee alum who gives big bucks to the program and the fact that he is starting this rumor or someone in the organization is starting this rumor during game week, is interesting. Yes Saban use to work as an assistant for the Browns under Bill Belichick, but why would he leave the best job in college football right now to be the head coach of probably the worst team in the NFL? The main reason Saban left the NFL in the first place is because he didn't have as much control picking the players as he does now and he and his wife didn't like the whole NFL atmosphere as a whole. 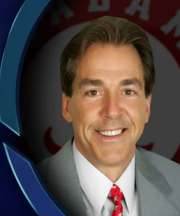 But as Alabama fans, we've come to expect that every year, that Saban is going to be wanted by college and NFL teams alike; Saban himself said recently he was approached by several teams at the end of last year. But he pretty much made it clear that once he rides off into the sunset, he'll be riding from Tuscaloosa, Alabama.